Efforts to raise funds for a new fair ground are underway for the 2018 year. GALLIA COUNTY — Though July may be a few months away, efforts to raise funds for fair relocation remain a priority for many in the community. The Fair Relocation Committee is kicking off the season with a vendor fair and cow chip bingo on Saturday April 7 from 8 a.m. until noon. The vendor fair will be in its second year, and is primarily focused on the buying and selling of tack; equipment for the care and use of horses. According to Jennifer Bonzo, a member of the Gallia County Youth Horse Committee, 4-H kids come out and set up to sell their equipment. “Vendor wise we tied it in that way so there will be traffic on the grounds. There is something happening so it makes it worth the gamble for someone setting up for one of these types of events,” said Bonzo. Others are also welcome to come out and set up shop to sell anything they like. Bonzo welcomes vendors from Lularoe to those trying to sell their yard sale items, anyone is welcome to set up and sell. For Gallia County 4-H members, it costs nothing. For out-of-county 4-H members, there is a fee of $10 dollars and everyone else is charged $20 dollars to sell. Starting at noon is the cow chip bingo. Entrants purchase a ticket at $20, which is randomly assigned to a square in the main show arena, where two calves will be walking around. Whichever squares become covered in the calves’ feces first wins the event. First place takes home $500, second place takes $200, and third will receive $100. “It used to be something they did all the time at the football field. We heard of it awhile back and we’re going to do one in the main livestock show arena. It will start at noon and go until the cows ‘poo’,” said Bonzo. Tickets for the cow chip bingo much be purchased ahead of time, and can be done so through the Gallia County Youth Horse Committee Facebook page or by contacting Bonzo at 740-821-4660. 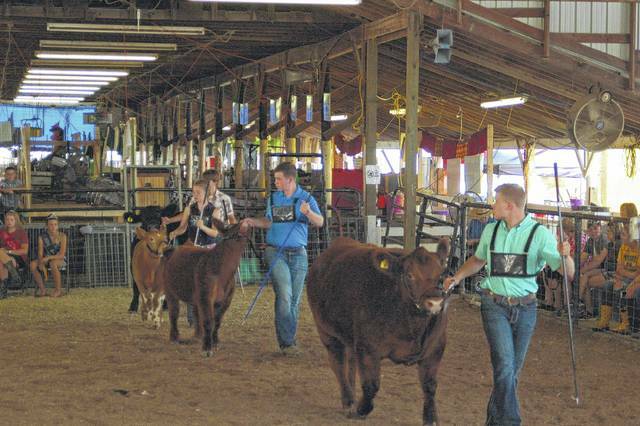 That particular day was chosen because it also happens to be the same day that 4-H members will be doing Quality Assurance with their animal projects for the fair. Students will be working with instructors on how to safely care for their animals and the correct way to show them at the fair. “Quality assurance is necessary for kids to show animals at the fair, four learning stations will be set up to teach kids how to properly care for the animal,” said Bonzo. With renewed efforts to raise funds, the committee has their eyes set on a goal of establishing infrastructure for the new grounds. To learn more about the event and efforts to relocate the fairgrounds, visit the youth horse committee’s Facebook page and look up the “A Fair for our Future” page to stay up-to-date on upcoming news and events.